KAHLOTUS -- Recreation traffic through the navigation lock at Lower Monumental Dam has been suspended after loose concrete was discovered on a section of the lock wall at a repair site. Commercial vessels will be able to use the lock while repairs are in progress, but there may be some delays. Operations officials at the dam will reopen the lock to recreational vessels once the loose concrete is removed. In a release, U.S. Army Corps of Engineers officials said the section of the lock wall, called monolith 15, is undergoing a three-phase restoration project to replace aging concrete that has been cracking and breaking into fragments. Two of three phases of repairs have been completed and planning for the final phase is under way. 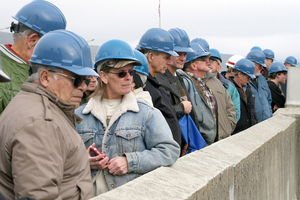 The first phase of the project was completed during January and February 2010, when workers removed about 1,400 tons of concrete from of the upper portion of the lock wall along monolith 15, an area approximately 100 feet high by 60 feet wide. During the second phase, performed between December and February, crews completed removal of the concrete section down to the navigation lock floor and installed new concrete up the wall to a level just above the water line at the downstream or "tail race" level. The third phase, which will be scheduled when funding becomes available, will place new concrete in the remainder of the repair area.